Network Rail has chosen Preservica’s cloud-hosted active digital preservation platform to safeguard its unique cultural, brand and business information. Oxford, UK | 18th January 2018 | Network Rail has partnered with Preservica to create a new cloud-based digital archive designed to actively preserve and provide secure access to vital operational information and unique digital assets from the history of the UK’s railway network. Established in 2002, Network Rail is responsible for the development, maintenance and operation of the UK’s railway infrastructure. Digital information held in Preservica’s AWS hosted digital preservation platform will be used to inform new projects across the business, and meet legal obligations under the Railway Heritage Act 1996 to make important business and infrastructure records accessible indefinitely. The new archive will serve the dual role of protecting born-digital business information generated since 2002, and digital heritage content. This includes organisational, corporate and operational records such as annual company reports, board meeting minutes, timetables and marketing campaigns, as well as valuable digitised artefacts such as Brunel’s railway engineering drawings dating back to the 1830s. Priority materials for transfer to Preservica include Network Rail’s extensive digital film collection. 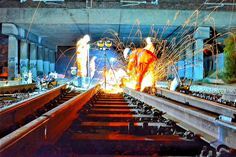 These include timelapsed videos of projects such as the Ordsall Chord Great North Rail Project in Manchester and work on the concourse roof at Kings Cross station in London. Preservica’s active digital preservation technology will ensure these critical information assets remain readable and useable over decades through active management and migration of files as older formats become obsolete. Vicky Stretch, Archivist at Network Rail, said: “We’re handling and preserving our records using Preservica to engage people in both the history of the railway and in Network Rail’s role in delivering a 21st century railway infrastructure. Safeguarding our cultural and business records will ensure a high degree of access over time. It also allows our team to manage our information intelligently and efficiently. Preservica is running a series of webinars to help Corporate and Business archives build the case for digital preservation. Learn more and register for the next in the corporate archives webinar series on January 31st 2018: ‘Getting the support of your CMO’, featuring the former CMO of Time Inc. UK. It’s a proven solution that’s trusted by business, archives, libraries, museums and government organisations around the world – including the Associated Press, British Telecommunications, Transport for London (TfL), Texas State Library and Archives, MoMA, Yale and HSBC – to name a few. Network Rail owns, manages and develops Britain’s railway – the 20,000 miles of track, 40,000 bridges and viaducts and the thousands of signals, level crossings and stations (the largest of which we also run). In partnership with train operators we help people take more than 1.65bn journeys by rail every year and move hundreds of millions of tonnes of freight, saving almost 8m lorry journeys. We employ 38,000 people across Britain and work round-the-clock, each and every day, to provide a safe, reliable railway.